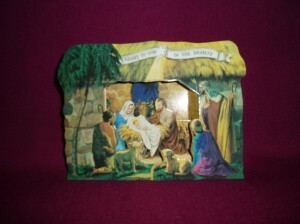 This traditional 3D paper nativity, measuring 14cm x 11cm, is a very attractive addition to the family Christmas display. The nativity has "depth" when free standing. It is also an inexpensive gift for a class of school children. Larger orders of 20 or more can attract a 20% discount -- to receive this discount, please contact us by telephone or email to put the items on an account invoice (an account can be established easily if not already in existence).